Ok before I get started, I need to tell you that I have a problem. My problem is that the letters on my keyboard have worn off. So today when I started to type the title for my blog post, I put my fingers down in the wrong spot and typed Nake It Monday by accident. Horror of horrors………….but then I thought, hey that might attract some new viewers to the blog………………but no, not my target audience……….so I fixed it. Today’s challenge is to use a cascading ombre technique. Not withstanding my typing problem, this card came together quite quickly. Supplies: Papertrey Ink Super Succlents stamp set, Hero Arts and Simon Says Stamp inks, Simon Says stamp cardstock, Recollections card base, Neenah cardstock and Scor tape. Here is the inspiration photo for the Blog Hop Challenge. I decided that I wanted to capture the texture of the paint as well as the colour. At first, I thought about digging out some Acrylic paints but then decided that coloured embossing paste would really emphasize the texture. 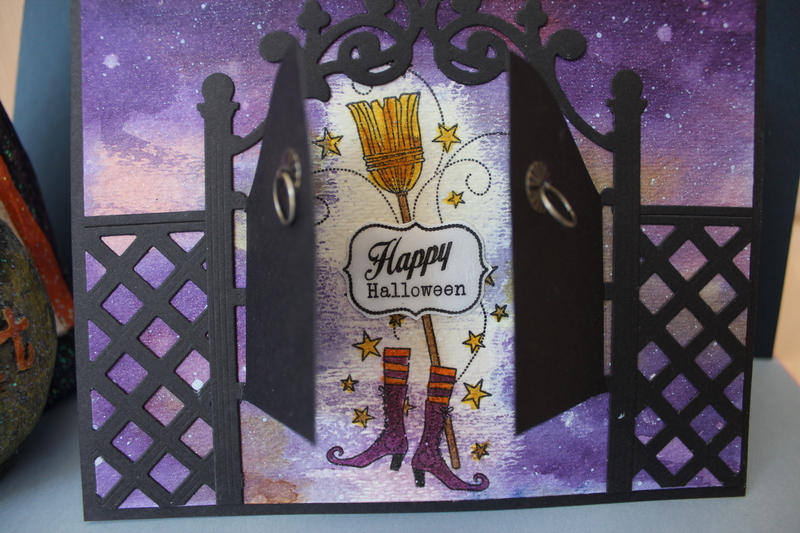 I had the paintbrushes from the Friendship Jar Fillers set so the card came together quickly. I coated the paintbrushes with clear embossing powder so make them stand out more against the strong background. I think it turned out quite well. The theme of this month’s challenge is friendship. Who could resist the inspiration photo.? This is an interaction between a squirrel and a bird and that got me to thinking about an interactive card to depict friendship. I had these “scratch off” stickers in my stash and I thought they would be fun to use. The card just evolved from there and I think it has a nice degree of cuteness overload! Just for the record, my “go to” stamp set Great Chemistry once more came to the rescue to provide the question marks on the stickers. There was a fair amount of colouring on this card, so I was hesitant to actually scratch off the stickers and render the card “useless. I did want people to see how the scratch off stickers worked, so I closed my eyes and did the scratching. The card just turned out so cute, I know I will make another one to really send in the mail. Supplies: Paper Smooches Happy Camper, Ahoy me Hearty and Great Chemistry stamp sets, Ink Antics scratch off stickers, Ellen Hutson Woodgrain cardstock, Memory Box Lawn die, Ranger Manila cardstock, Neenah cardstock, Scor tape. The challenge today is to use a cover plate and cut strategic parts out of it to put on a tag. I had to scramble a bit as I don’t have any cover plates and I don’t have any Papertrey Ink tag dies. This is somewhat astonishing given the size of my Papertrey Ink stash, but true none the less. With a bit of “poetic or in this case crafting license” I think I made something with the spirit of the challenge. Supplies: Papertrey Ink Shakers and Sprinkles Kit dies, Recollections cardstock and ribbon, Zig Two Way and Elmer’s spray adhesive. The object of this challenge is to find something from the August release that inspires me. The hard part is that the stamps and dies have just been released and have not yet have had time to be delivered to me. 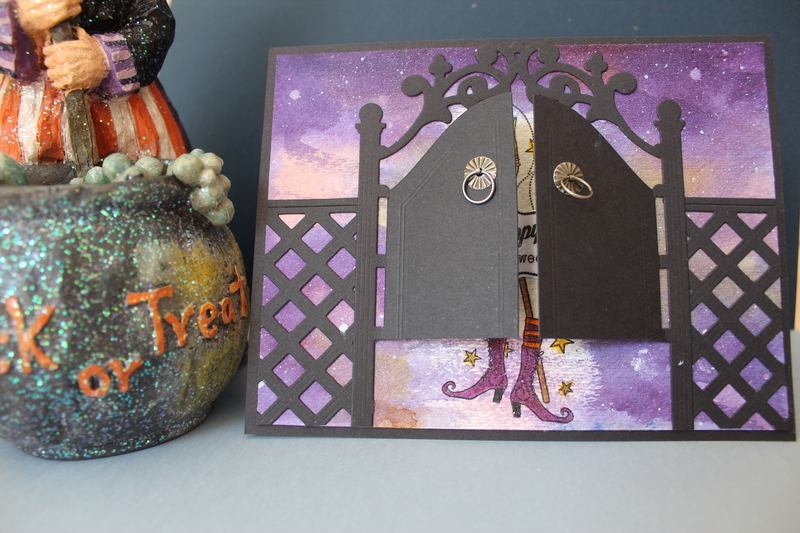 I like the Tiny Town new addition called Spooky Town so that set the theme of Halloween and I am totally smitten with my Make it Market-Garden Gate Kit so I decided to combine these. It is amazing sometimes what a difference colour makes. I think of the Garden Gate as light, pretty and delicate, but die cut it in black and it turns ominous immediately. I wanted the sky dark and spooky and yet I wanted the image behind the gate to stand out. I had been thinking about different uses for Microglaze since taking Chemistry 103 from Tim Holtz. It occurred to me that I could use it as a mask to isolate the stamp image from the dark watercolour background. I had a couple of misfires with ink selection (Microglaze smears Versafine just so you know) but finally came up with a technique that worked. I was trying to get a textured circle of Microglaze around the image that would look feathered. I think if I had used a tiny corn broom type brush,it would have worked a bit better, but then I thought about how having a wax coating on half my stencil brushes would maybe not be a good thing for future projects, so I called it done. My resolve to quit buying so much crafting supplies melted when I saw this limited edition kit at Papertrey Ink. I think the resolve only lasted about ten minutes because………what can I say………..I am weak. This kit is just so much fun and choc-a-bloc full of stamps, dies and paper. I usually like to make my own designs, but today I cased a sample from the instructions included with the kit. This project is a box that holds four cards that can be given as a gift. I especially love the Wisteria! Take a look. Holy crap! I have been trying to catch up on all the techniques presented in Chemistry 103 online class. One thing I can tell you is that I have gone through enough baby wipes to keep the Dionne Quintuplets clean for five years! There is at least 5 techniques a day times 6 days of classes, and each technique is a combo of mini techniques, so you can begin to see the toll on baby wipes. And that is before you count the mishaps, like the one when my Cracked Pistachio spray stain wouldn’t spray UNTIL I turned the spray bottle toward my face. I am having fun getting inky, even though I am hurrying to complete my techniques binder before I leave on holidays. This sample on Yupo just turned out to well to end up on a tag rather than a card. You just gotta love how the ink sprayed out naturally from the middle of the one red flower. I am still in awe of that. I have a pile of half completed samples from this class. There are several techniques that use products with a longer than usual drying time. This means my craft room looks like a paper laundromat. The sample I am showing here almost went in the round file several times. Luckily I followed Tim’s instructions to keep working on it by throwing in more colour and more blending solution and most importantly more imagination until it started to look like something. One of the techniques shown today used three products that I love, but have been languishing unused in my stash. What a great opportunity to break them out again. The products I am talking about are Distress Markers, Stencils and my Compressor. The technique is called Distress Marker Spritzed Watercolour. I confess that I had never before used my compressor with any marker other than Copics. At first I fashioned a tape around the marker barrel to fit it snugly into the Copic spray handle, but it wasn’t long before I figured out a way to hold the marker just right and get it to spray with out the fuss. I took Tim’s suggestion and decided to try it with a stencil, since I hadn’t used a stencil for a while either. I tried the Roses stencil and this Treads one. They both worked beautifully. I like the resulting card. I think it is a great, and hard to come by, artsy masculine card.